I've always loved studying history. I like to think an understanding of history will ensure 'history never repeats'. My faith in communities learning from their history has been tested of late. This year I was contacted by some elders from the Aboriginal community in Moree to help with a legal problem. Their names were familiar from my history books, as citizens who stood up to segregation with the freedom riders in 1965. Despite Moree priding itself these days on reconciliation, members of the Aboriginal community continue to fight for their rights. The fight is now to preserve their own culture and history from commercial interests. The fight is dividing their town yet again, but this time it is dividing both black and white. Moree is a town like many in regional Australia whose population and community are in decline. The Moree Council has experienced the greatest population decline in NSW of late. The community is desperate to stem it. They've picked an unlikely saviour. Many believe the solution is the construction of a discount department store. Such is their passion that they are willing to sacrifice their main oval in town to the cause. Instead of seeing cricketers and rugby players strutting their stuff on Taylor Oval, you could shop till your heart's content in the new Big W marketplace. And Moree would rise again to stake its place as a regional retail centre with jobs for all. But an unlikely coalition of old cricket and rugby players and some members of the indigenous community have been fighting the proposal. The old players cannot believe their Council would develop their oval, which has been at the heart of reconciliation in their town; where black and white played cricket and rugby league for generations. Many greats of Australian sport — Don Bradman, Clive Churchill — played on Taylor Oval. More importantly, traditional owners believe the oval is a burial site. Two Aboriginal bodies were found under the oval during excavations in 1903. But many Moree residents, including the Council and proponents of Big W, remain sceptical, and are intent on more testing before accepting that the site truly was a burial ground. Nor is it enough that the site is also where a young Aboriginal man was killed in race related tensions in the 1970s, or where other ceremonies have been performed to recognise Aboriginal leaders in Moree. In Moree it seems history and culture have no place in the pursuit of economic growth. Although it would be easy to see the Council as the villain in this story, the truth is that our society as a whole accepts commercial interests can take precedence over conserving stories and culture. And companies continue to pursue economic gain above all else, particularly above a sense of community and history. Taylor Oval is adjacent to the local Woolworths. It is easy and flat to build on, and will consolidate Woolworths' commercial interests in town. Big W is refusing to meet with the Aboriginal community, as the Council has approved the plans and believes the town has decided. Majority rules. The NSW Government shares some of the blame. It is willing to sell public land to make a quick buck. Instead, the Government could have worked closely with the Aboriginal community to find a suitable site that would not prove so divisive. The struggle over Taylor Oval shows us how far we, as a nation, still need to travel to heal the wounds of our past. The leaders in the Moree community have played on racism. They dared to hold a protest to support the development on the day of the National Apology, despite supposedly believing in reconciliation. Many in the Aboriginal community are scared to voice their concerns for fear the rest of the community will blame them for Big W not coming to town. With 25 per cent unemployment in the Aboriginal community they are also desperate for any jobs Big W might bring and don't want to be further victimised by the majority. The intractable division in the Moree community means this dispute will have to be arbitrated by the Courts. It shouldn't have to be this way. Our communities should be able to think of creative solutions to these issues of how we build better communities and opportunities for all. More importantly, large corporations and our governments should show leadership and respect for Aboriginal culture. How long will it take for us to learn from history? Kirsty Ruddock is Principal Solicitor with the Environmental Defenders Office NSW. She graduated with Arts (Honours)/Law (Honours) from the Australian National University in 1995 and has a Graduate Diploma in Arts (writing). Recent articles by Kirsty Ruddock. When I read this article I felt a burst of useless grief and rage. I felt a tiny forerunner of it in the supermarket last week when I saw a tin of Anzac Biscuits with a pretty picture on the cover of poppies (presumably from Flanders field). Can't our memories hold anything now but symbols useful for commerce? What about courage, dignity, reconciliation, pain and healing? Are all our sacred symbols no more than marketing tools now? How can we combat this loss? One would hope that in the spirit of the Federal Governments Apology and their Close the Gap Policy there would be some way in which they would intervene in this situation. It appears that the Moree community and in particular the Indigenous people are to pay the cost of the NSW's Governments financial mis-management. Well excuse me Will you get the full story. I'm so sick of the media only getting half the story. Taylor oval was never used before big w wanted to bulid on it. We planned our big w rally way before "sorry day"! There is like 5 people whinging and them 5 people have recked this town thats why the population is in decline. Funny how you guys think 5 people is half the town well i think you guys you write the truth next time and get your facts right! I'm a Moree Murri, and i have fond memories of playing football and watching my famous Moree Boomerangs playing at Taylors Oval. The Moree Council have plenty of locations to choose from, just because Taylor Oval is in close proximity to town and that it isn't used as much these days is not a valid arguement to give approval for the so called 'economic growth' they seek to save Moree. Taylor Oval is a traditional meeting place for both the Aboriginal and non-Aboriginal people of Moree. It is an icon which needs to be protected. Moree Council continues to only have business minded non-Indigenous men making all the decisions for Moree, when it is such a culturally diverse community and could achieve positive outcomes to make a difference for all. Money won't change the problems in Moree, it will need to begin in the hearts of the people who still cannot respect Moree Aboriginal people's culture and heritage which Taylor Oval is a part of. There is no other locations big w can go! It wont survive anywhere but taylor oval ... But i know moree is dying i just feel sorry for the farmers who are stuck here. Everyone except for about 5 people wants this development on taylor oval! Stop making moree seem worse than it already is. You come to moree and ask people around town what they want and all of them will say big w on taylor oval. So get your story right! it's not that hard. I can guarantee you that people will travel far and wide to get to the wonderful Big W store and money will pour out of your local business into another multinational. Keep the oval and push the evil retail giant out of town. There probably are more than five people protesting, but 90% at least want big w on taylor oval. Big w needs to be as close to the CBD as possible. Good on you Kirsty. It is great to see you standing up on these issues. Very best wishes. Also, think about this: close to 3000 people attended a rally in support of YES to big W on Taylor Oval, but only an estimated 100 people attended the NO to big W rally! ive lived all around regional nsw. and travelled to lots of regional towns and im here to tell you moree is doing very well compared to most towns. You have a large tourism magnet the springs which draws in huge amonts of visitors. The marketing towards ederly and sick people has worked. Last time i travelled thru all the caravan parks with pools were full. a lot of other regional towns have no tourist attractractions and no visitors. The issue here is greed. at the cost of humantity. There are acient burial grounds there any spiritual person can feel it. I will personally be laughing when your greedy karma catches up to you. When you start building everything will go wrong. you think your towns in trouble now. Its only the beginning. Mark my words nothing but bad will come to that site and town if you ignore the traditional owners pleas to respect the dead and there rest. I live in Moree and your facts are wrong, it is not our main oval, we have 5 others with much greather facilities. Taylor oval does not even have toilets. The claimed Aboriginal burial site is not even true, if you read the original sroty printed in the Moree Champion when the body was discovered it was a white person. The person involved in causing these outrages claims does not even live in moree any longer, he simply wants to destroy the town due to not having council support when he wanted to purchase the old leagues club. i cant stand people giving there "two bobs worth" without knowing the full picture. 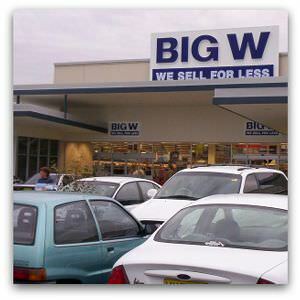 Without Big W this town will decrease even more in population.